After watching Captain America: Civil War, I was struck by how likable all of the characters were, including the Vision. The Vision was introduced in Avengers: Age of Ultron, but I didn't really warm up to him until Civil War. It is definitely because of the fact that we see him expressing many more emotions, which makes him seem much more of a layered and interesting character. But also, it is due to the fact that he is walking around the Avengers facility in a sweater/collar shirt combination, as if he is trying to fit in with the humans by dressing like a dad. 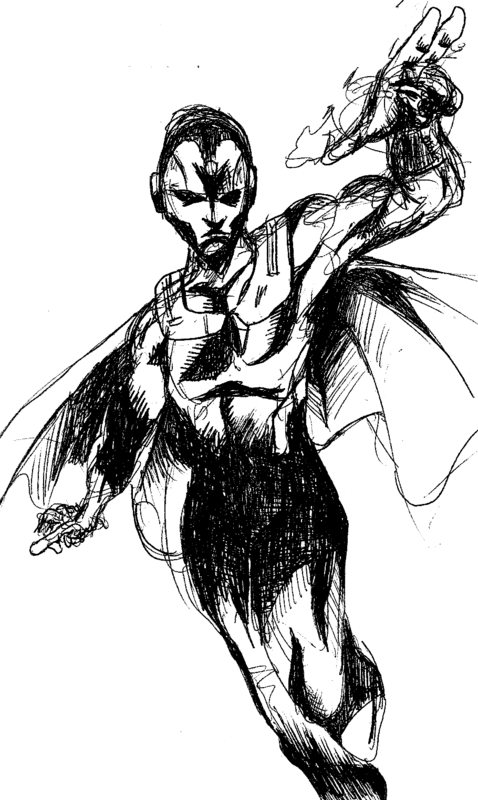 Relating to the drawing, I am trying to really utilize more shadows of the characters, as exhibited by the level of blacks in the Vision's figure. Also, I am playing with the cape more, making it appear that it is furiously fluttering in the wind. Typically I would draw lines on the cape to indicate the folds, but I find it much more interesting looking to draw the cape folding onto itself where it looks like a cluster of fabric. I am really happy with how the shadows of the face turned out. It is always hard to figure out how much shadow to have on a face because you don't want to obscure the emotions or features. But for the Vision, he looks good as a scary, emotionless being. And also, since he is a robot (synthzoid) he has crazy deep cheekbones that look great in shadows.